Further expanding its global footprint, AEG Facilities, a stand-alone division of the world’s leading sports, venue and live entertainment company AEG, has been selected by Buenos Aires Arena S.A., a company controlled by La Nación, Argentina’s leading media company, to manage and operate the Buenos Aires Arena, now under construction in Buenos Aires, Argentina. Set to open in mid-2019, the state-of-the-art indoor venue can entertain up to 16,000 guests and will host approximately 100 events annually, including concerts, family shows, festivals, corporate, and special events. As part of the multi-year, comprehensive management agreement, AEG Facilities will be responsible for all aspects of the arena’s operations beginning with directing all pre-opening functions including overseeing the hiring and training of the venue’s full-time staff and planning and executing the arena’s grand opening activities while managing key departments such as event operations, sponsorship and premium seating sales, booking, security, ticketing, guest services, marketing, public relations, finance, human resources, and overall event management. “We are thrilled to partner with AEG, the leading arena owner and operator in the world, in our new state of the art venue in Buenos Aires. 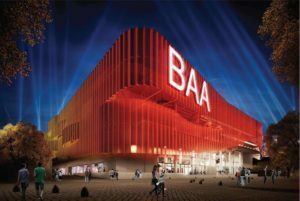 We believe AEG is the right operator for our arena and that together we will bring outstanding quality entertainment experiences to Buenos Aires,” said Luis Saguier, Director of La Nación. Located in the geographical heart of Buenos Aires, specifically Villa Crespo, the venue will be readily accessible by 19 bus lines, subway and two train lines. The project will be overseen from AEG’s regional headquarters in São Paulo, Brazil, led by Venancio Castro, Executive Director, AEG LATAM, with additional resources provided by AEG Facilities’ network of offices and venues regionally and globally. This is the second multipurpose arena that AEG Facilities has added in South America recently, with Montevideo, Uruguay’s Antel Arena set to open later in 2018.